HP's HP Mini 210 (NB-210-1017TU_01) netbook is stylish, comfortable to use and easy to upgrade. Although it has standard specifications, its look and feel are very different to most netbooks', and it's a much more refined product than the netbook it replaces (the HP Mini 110). We like it a lot, but wish it had 802.11n Wi-Fi, more RAM and extra features, such as a Sleep-and-Charge USB port. The HP Mini 210 (NB-210-1017TU_01) is a 10in netbook with plenty of style. It looks and feels different to the netbook it replaces — the HP Mini 110 — but it still performs like a netbook. It offers a very solid keyboard with isolated (island-style) keys, a very smooth and responsive touchpad and an enclosure that feels almost rubbery when you touch it. Like most netbooks, it has its drawbacks: it gets warm, it only has 1GB of RAM and 802.11n Wi-Fi is absent. 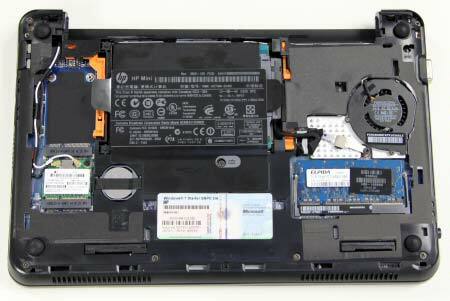 The HP Mini 210 (NB-210-1017TU_01) is a netbook with better than usual styling and design. It feels almost futuristic with its textured lid and base, edge-to-edge glossy screen and concealed touchpad buttons. Furthermore it has no annoyingly visible and extremly bright status lights — it's almost stealth-like in this regard. The power, hard drive and battery indicator lights can be found on the sides. The Wi-Fi, caps lock, mute and 'touchpad disabled' lights are visible on the top of the system, but only when these features are enabled. Even the panel on the base of the netbook seems futuristic: you don't have to use any tools to remove it in order to get to the single memory slot and 2.5in hard drive bay. Simply remove the battery, press the release buttons and pop off the cover with your fingernails. Admittedly it can be a little difficult to remove and at times it feels like the plastic clips that hold the panel in place might snap, but if you're slow and careful they won't. The bottom panel snaps off to reveal the 2.5in hard drive bay and the single memory slot. The bottom panel doesn't have any vents and it is one single piece of plastic. To keep cool, the internal components rely on an air intake vent on the right side and an exhaust vent on the left through which the small system fan pushes out the accumulated warm air. When you use it on your lap — even after a short amount of time — the vents can get blocked and it gets noticeably warm around the hard drive and CPU areas. This becomes uncomfortable after a short while and it's not a good thing for a notebook that's designed to be highly mobile and used on a lap. Typing for long periods of time on the Mini 210 is relatively easy. The palm rest is 5cm deep and the keyboard's keys are spaced 4mm apart and are 8.5mm wide. The shift keys are large and there are no keys in awkward positions. The up and down arrows are small, but you get used to this quickly. There are no page up and down buttons, which is inconvenient if you use these keys for navigating Web pages. The main job of the function keys is to let you change the screen brightness, volume, Wi-Fi status, screen output, and even let you control a media player all without you having to hold down the Fn button while pressing them. It's a very convenient arrangement. We absolutely love the touchpad on the HP Mini 210. Unlike the touchpad on the Mini 110, the left- and right-click buttons are in their conventional location along the bottom edge of the touchpad instead of being either side. 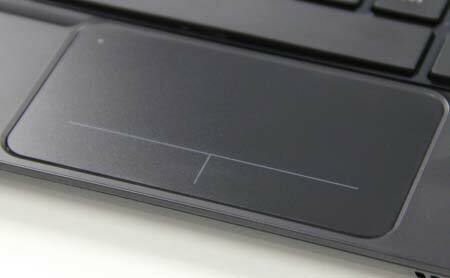 They are concealed under the touchpad (HP calls it a Clickpad). This allows the entire pad to be used for navigation, yet the buttons are still very easy to press. The only problem with this design is that you can't use separate fingers to navigate and click on the buttons at the same time. The pad itself feels very smooth and soft and it's perfectly responsive. It supports three gestures: pinching, scrolling and rotating. It doesn't get in the way when you type, but you can disable it by double tapping its top-left corner. The touchpad buttons are concealed beneath the pad itself, which gives you more surface area for moving the pointer and makes the pad very comfortable to use. While the outside of the HP Mini 210 gives plenty to talk about at dinner parties, its gizzards will bore. You get an Intel Atom N450 CPU that runs at 1.66GHz and has an integrated Intel GMA 3150 graphics controller, and it offers the same performance as previous generation netbooks that ran Intel Atom N280 CPUs. This netbook also has only 1GB of RAM — we wish it had 2GB — but it runs a spacious 250GB, 5400rpm hard drive. This configuration recorded a fractionally better time in our iTunes MP3 encoding test (7min 42sec) than the Toshiba NB300 (7min 46sec) but a slower time in Blender 3D (6min 56sec compared to 6min 48sec). The Mini 210's hard drive was very fast, recording 27.53 megabytes per second, which is much better than the Toshiba's speed of 18.92MBps. During general use the HP Mini 210 felt reasonably swift, although sometimes it was a little slow opening an application or switching windows. There is plenty of preloaded software on it (nothing new for an HP system) which you can uninstall or disable in order to make it run smoother. We dislike the setup screens that HP makes you go through when you first boot up the Mini 210, which pertain to enabling updates and system protection. If you don't enable these settings, then you'll end up being reminded time and again until you disable those screens, too. It detracts from the overall user experience. What we do like is HP QuickWeb, which is based on Splashtop technology and offers an environment that cold boots in a few seconds. It's perfect for the times you just want to use the Internet and don't want to load Windows 7 Starter. 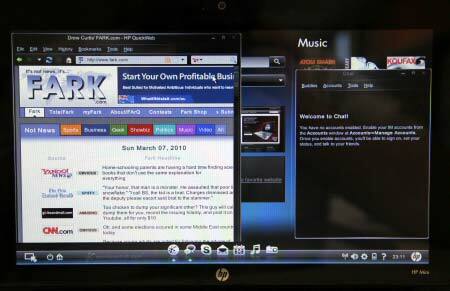 You can browse the Web, use chat and Skype applications, and view photos and listen to music off your hard drive. You can even multitask in it. The Mini 210 needs a hard drive in it to work though, so those of you wanting to be radical and remove the hard drive in order to run Splashtop exclusively will be disappointed. QuickWeb is a comprehensive Splashtop-based interface for Internet communication, browsing photos and listening to music. One feature that would make the Mini 210 a killer tool is an integrated 3G modem. There actually is a space for one in the chassis (as well as a dummy SIM card reader in the battery compartment) but there isn't an option for a module in any of the models in the Mini 210 range. There are three USB ports that can be used to plug in a USB-based 3G modem if you want to use the Internet while you travel. You'll be able to get a lot of life out of the Mini 210 while you're on the road, because its battery is far from mini. It ships with a six-cell battery by default, and in our rundown test — in which we disable power management, maximise the brightness, enable the Wi-Fi radio and loop an Xvid-encoded video — it lasted 5hr 11min. This is slightly better than the Toshiba NB300, which also has a 6-cell battery and lasted 5hr 2min. It's an expected result: the battery in the HP has a rating of 62 Watt hours while the Toshiba's battery has a rating of 61 Watt hours. The screen has a native resolution of 1024x600 and it's bright enough to use outdoors and indoors with the lights on. It has a glossy plastic pane that extends from edge to edge. This will reflect light, which will possibly infuriate you while you try to view photos and videos. It has a webcam at the top as well as a microphone and two concealed Wi-Fi antennas. The netbook's lid is strong and the hinges hold it perfectly in place. With its asking price of $599, the Mini 210 is almost unbeatable, but it could use some more features. In particular, we'd like 802.11n Wi-Fi, an integrated 3G modem, and a USB Sleep-and-Charge-style port would be very useful for travellers. But as far as design and ease of use are concerned, the HP Mini 210 is excellent. It's a vast improvement over the Mini 110.